Rocket found exploded in open area on Saturday believed to have been part of barrage fired by ISIS affiliate Sinai Province in Egypt. 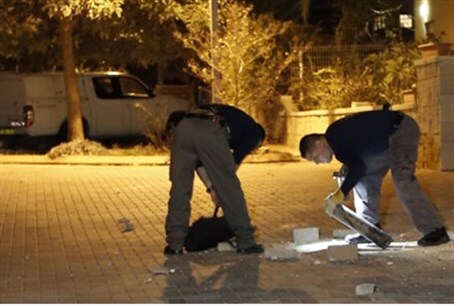 Israeli security forces found a third exploded rocket in the Eshkol Regional Council area on Saturday afternoon, Channel 10 reported. The rocket is believed to be part of a barrage of missiles fired from Egypt into southern Israel's Gaza Belt region on Friday afternoon. Residents of the area were forced into rocket shelters after sirens sounded at approximately 4:20 p.m. local time. The rockets, two of which were found on Friday, exploded in open fields. No damage or injuries were reported. An IDF investigation revealed that the rockets had likely been shot from terrorists in the Sinai Peninsula, which was confirmed by the Islamic State (ISIS) jihadist group's affiliate in Egypt. "Three Grad rockets were fired at Jewish positions in occupied Palestine," the group, now known as Sinai Province and previously called Ansar Bayt Al-Maqdis, said in a statement on Twitter. In the wake of a multi-pronged terror attack on Wednesday, in which some 50 Egyptian soldiers were killed by Sinai Province, Israel has upped security along its border with Egypt. The IDF temporarily closed Route 12 to civilian traffic on Friday as a "security precaution." Additionally, an Iron Dome was stationed in Eilat for fear the jihadist group would launch rockets into the city.